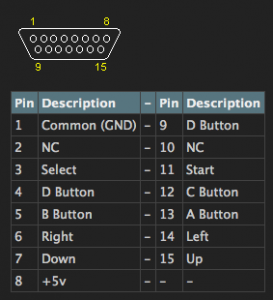 This entry was posted in Arduino, Friday, Gaming, hardhack, programming, raspberrypi and tagged advancemame, arcade, Arduino, emulation, gaming, geo, hardhack, MAME, neo, neo geo, pi, programming, raspberry, raspberry pi, raspberrypi, rpi, snk by SSilver2k2. Bookmark the permalink. I almost went the USB keyboard emulation route myself when I was working on my MAME cab, but it was pointed out to me that USB keyboards only allow 6 simultaneous keypresses by default (unless you’re very careful about which keys are being mapped…), so I changed gears and went with another Arduino-based method that directly emulates joypads. It’s actually super easy to emulate X number of joypads with Y buttons with some of these projects out there. Check out my page for how I went about it if you’re curious, but basically I used a small AVR with a bunch of shift registers, and it works great. I’m using a teensy++ for my keyboard emulation. It’s basically an Arduino Leonardo with a lot more capabilities. PJRC.com develops and produces them. Do you have any code samples ? I have tried using my Leonardo as a arcade joystick -> USB keyboard and while it works in notepad and i can see the key presses, MAME does not like it. I may get the odd response to the fire button but that’s about it.